Rather than working through each city one at a time I’ve been dipping in and out of different cities and processing whichever image appeals to me that day. Some images take a lot longer to colour correct than others. I’m still waging the battle against “creeping green” and now and again also against phantom dots. ( I’ve said it before, but I’ll say it again, if you’re working in Artistic TZ film scan as soon as possible). 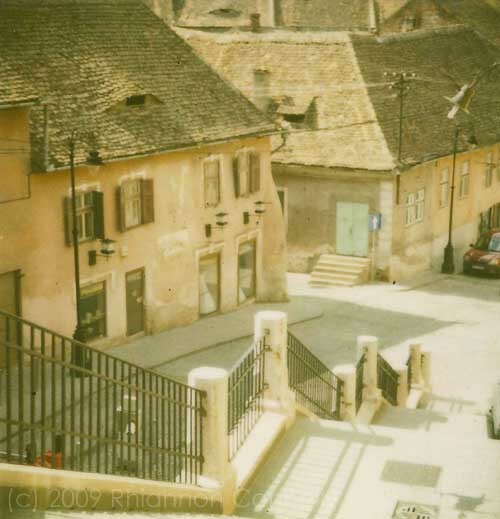 This image was shot in Sibiu from inside a watch tower – great views in all four directions and not too steep a climb. 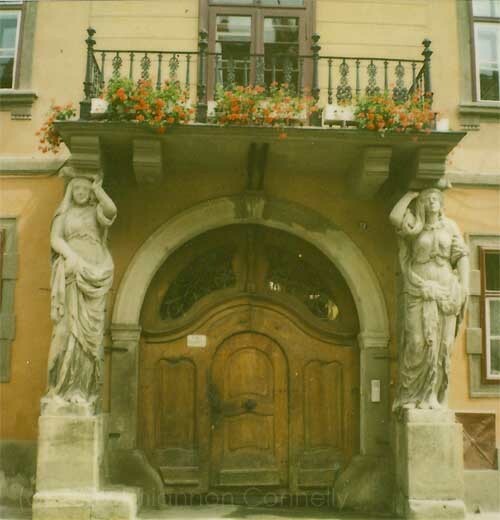 Sibiu and the other cities – how did I choose them ? While I am in my “little updates from the road” mode I thought I’d answer this as I am frequently asked this question. There were several things that triggered this project in the first place and one element was to use the Polaroid film I had left in an interesting way. However, I didn’t want to retrace my steps and photograph cities where I had already taken a lot of Polaroids. For this reason Edinburgh wasn’t included. Or Lisbon or even Dublin – all cities with great appeal. In the end the choice came down to a mixture of cities that I already knew well and others that would be new to me . I think it would have been pretty hard work to photograph 12 unknown cities in this way. It was hard enough to keep up with the preparation as it was, not to mention the languages. I also was trying for a bit of a north/ south “old’ and ‘new’ Europe mix. There was only one city that I wasn’t totally keen on photographing ( I’ll not name names to stay diplomatic ) and interestingly this city was much harder to do. The one non negotiable city , from the outset, was Sibiu. 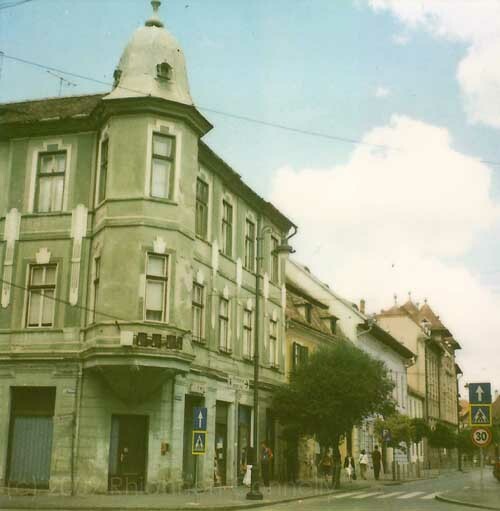 From my first visit to this city , a VERY long time ago, I adopted Sibiu as “my” Romanian city. Its not really something I can explain. I’ve never had the luxury of so much time here as this trip though – in the past it was always just a quick day or so, maybe 2 nights when I was doing the tours here. So it has been a real pleasure to see the city doing so well. I’ll do a fuller post on Sibiu in due course. As before, photo from the blog archive. Its raining so heavily I really couldn’t choose anything else ! Don’t have very long online so this will be a very unpolished update – I’ll polish it up a bit the first chance I have a bit longer online. Mainly I’ve been impressed with just how easy the trip to Romania has been so far. The last time I came here by train was 10 years ago and crossing the border was a real carryon – So I was slightly dreading how it would be this time. Hurray – quick look at passport , nothing else. In other respects I’ve felt quite nostalgic about my trip from 10 years ago – but this aspect was a real improvement ! Sibiu was also City of Culture 2007 and I think this must have speeded up a lot of the renovation work. Mostly I think it has been done very nicely – a few things are a bit of a pity. The changes to some of the distinctive dormer windows in the main square alters the character a little and I think the main square has lost a little character too, mainly from the removal of a row of trees. But on the other hand it has become a very accessible pedestrian area linking to the main street which is also pedestrian now and gives plenty of room for the cafes to spill out onto the street. Weather reports have been for torrential rain most days – fortunately in practice this seems to mean sunshine , with spells of rain. Even so , it does mean I’ve been working hard to do as many P0laroids as I can while it is bright and dry. If I can get my quota done by tomorrow or Monday then I plan to take a bus to a little village on the edge of town and do some more rural shots too. Well, noone came to claim the computer , so my update isn’t that short after all. It is liable to change though, when I have a bit more time.